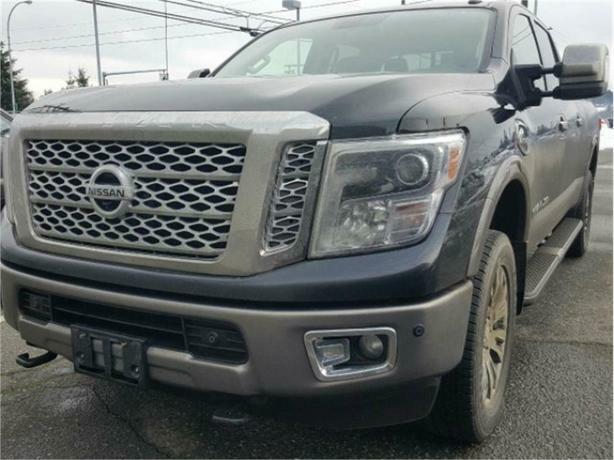 2016 Nissan Titan XD Platinum Reserve is like new! With all the luxury features including but not limited to leather interior with heated and cooled seats, dual climate control, navigation, around view monitors, Bluetooth and more. Aftermarket aspects include a Tonneau Cover, and a spray in boxliner. North Island Nissan Certified Used vehicles come with a standard 3 month or 5000 kilometer powertrain warranty, and a 15 day 1000 kilometer exchange privilege! Buy a car you love with confidence. See dealer for details! All pre-owned inventory goes through a complete 103 point safety inspection as well as a professional detail. All details include an exterior wash and wax as well as an interior vacuum, shampoo, and wipe down. Located at 2700 N Island Hwy, Campbell River! Give us a call at (250) 287-7272. We offer a big city selection with small town friendly service, which means a great experience for you!